while many migrants return to nicaragua during the december holidays, this year "the crisis" and economic limitations have made many decide to forgo visits home in favor of saving money and sending remittances. as a result, of the 10 families in my study, thus far i have only been able to interview 1 mother migrant, whom i spoke with at length this morning. our conversation included details about her migration, about her responsibilities as a "transnational mother", and about how her migration has impacted herself, her two children, and the rest of her family. she leaves jan. 10 to return to costa rica, so i was grateful for the opportunity to talk with her. 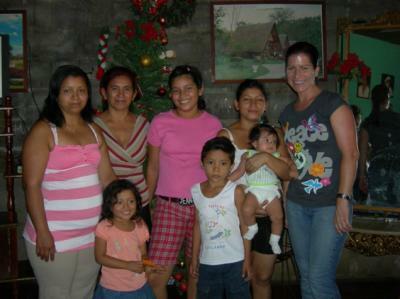 pictured here is the entire family: mother migrant, her mother (the abuela), her sister, and hijo/as.